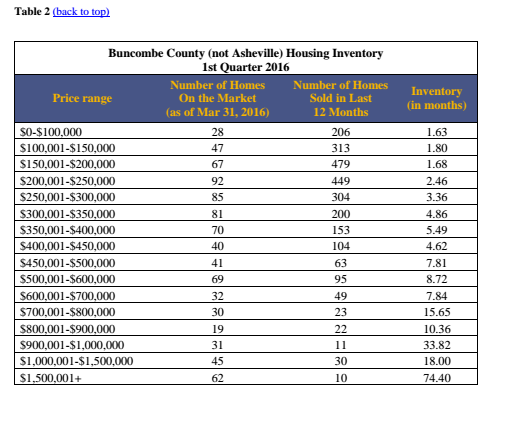 2016 started off strong in the Asheville Buncombe housing market. According to the analysis of the 1st Quarter of 2016 by Mosaic Community Lifestyle Realty, home sales were strong through the end of the first quarter. Median home sale prices climbed to a new quarterly record of $250,000 in Asheville. This indicates an 11.1% increase over the previous median price of $225,000 a year ago. 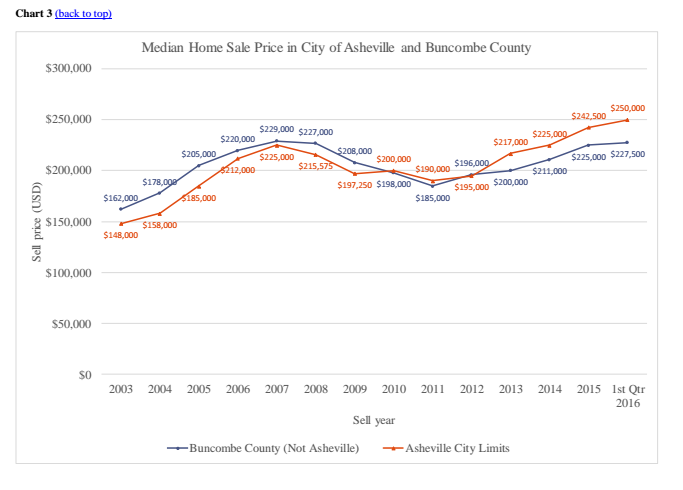 In Buncombe County, the median home price this past quarter was $227,500, 10.4% higher than the same time a year ago. Inventory, or the number of homes on the market, is a factor that is considered in determining the health of the housing market. 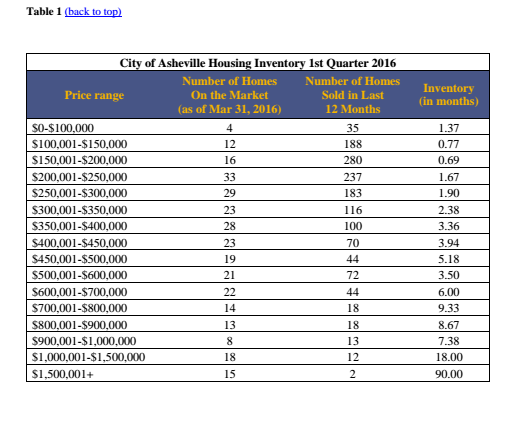 As of April 2016, inventory in Asheville was under 6 months in the price ranges below $600,000. For the $600,000 and $700,000 price range, inventory was at 6 months. This represents lower inventory levels in Asheville in the middle/upper price ranges compared to previous years. Inventory in Buncombe County was under 6 months for price ranges under $450,000 and was lower in almost every price range in the 1st quarter of 2016 compared to the same time period in 2015. The average Days on Market (DOM) in Asheville decreased to 69 days in the 1st quarter of 2016, the lowest since 2004. 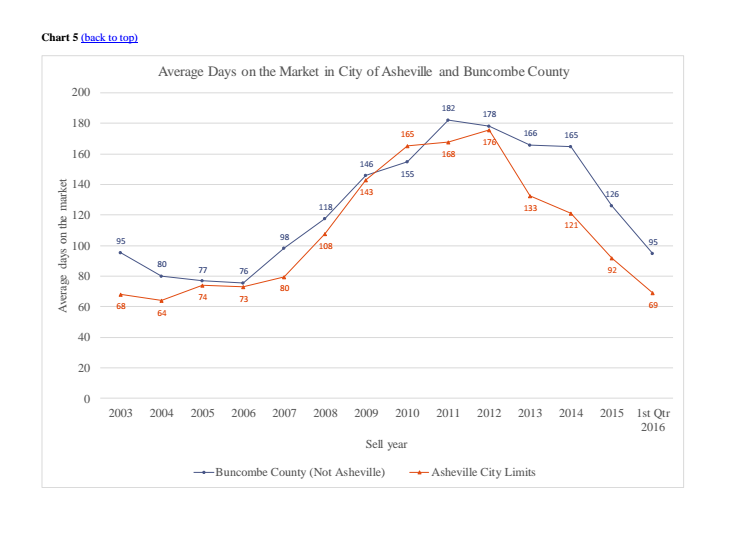 The average Days on Market in Buncombe County decreased to 95 Days on Market, the lowest since 2007. The peak in Days on Market in the years 2009 to 2015 was artificially inflated by an estimated 30 days because during those years, the MLS software counted days when a property was under contract but had not closed. The software no longer counts days for DOM calculations when a property is under contract. Median price per square foot increased in Asheville in the price ranges of $250,000 to $700,000 and slightly decreased in lower and higher home value brackets. 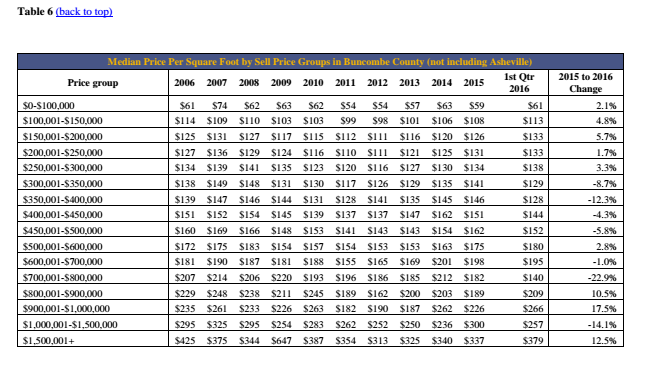 In Buncombe County, the reverse is generally true, with mid-level priced homes seeing a decrease in price per square foot and lower and higher end homes seeing an increase. Inventory of green homes both within Asheville and Buncombe county is below six months, indicating a healthy seller’s market for this subgroup. 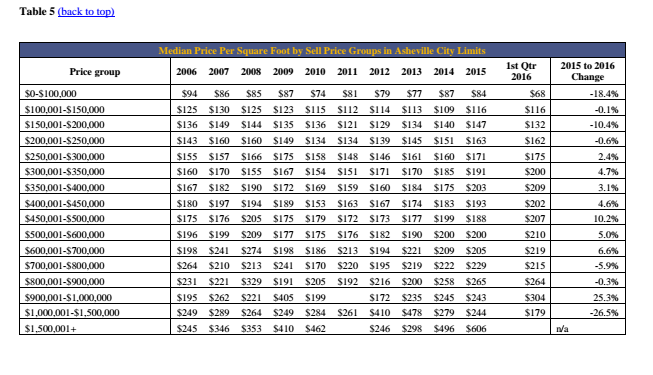 The median price per square foot for Asheville’s green homes is $217 versus Buncombe County’s $183 per square foot. For more information on real estate in Asheville, please contact Mike Figura at mike@mymosaicrealty.com or call him anytime at (828) 337-8190.